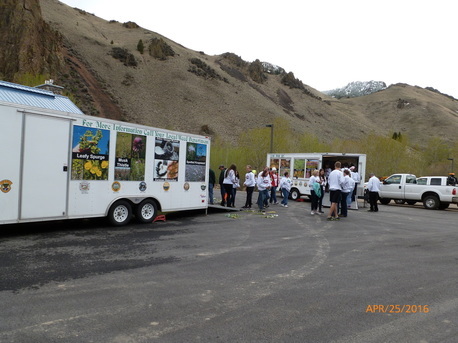 The 2019 Idaho Envirothon competition will be held April 29th and 30th at the Living Waters Ranch in Challis, Idaho. ​ Thanks to Life on the Range for their great work! The Idaho Envirothon: is a hands-on environmental problem solving competition for high school aged students in the Idaho. Participating teams complete training and testing in five natural resource categories: Soils & Land Use, Aquatic Ecology, Forestry, Wildlife, and the current issue. Winning teams from each state and province advance to the North American Envirothon for an opportunity to compete for recognition, scholarships, and prizes.